For people in Central West Slopes and Plains, Riverina and parts of Central Tablelands, South West Slopes, Lower Western and Upper Western Forecast Districts. Issued at 11:59 pm Tuesday, 6 November 2018. 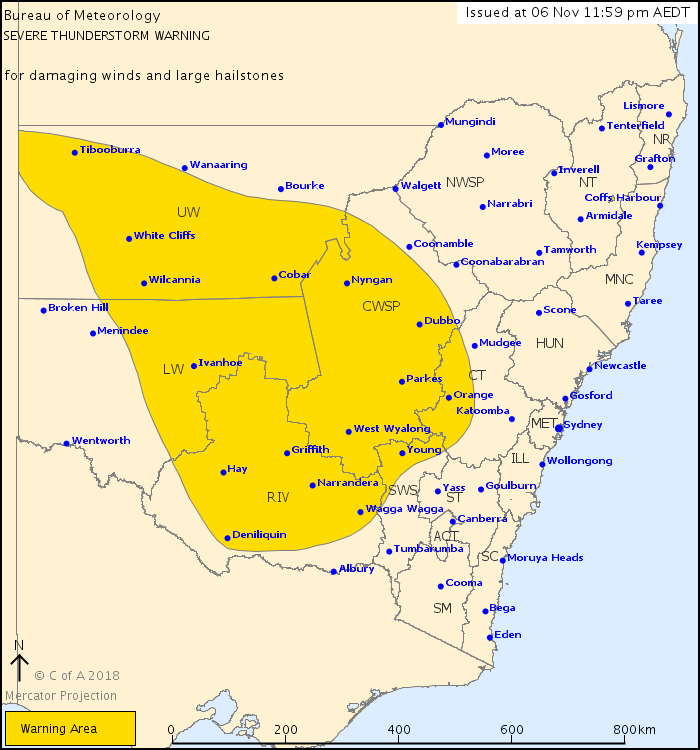 Severe thunderstorms are likely to produce damaging winds over the next several hours in the Central West Slopes and Plains, Riverina and parts of the Central Tablelands, South West Slopes, Lower Western and Upper Western districts. Locations which may be affected include Orange, Bathurst, Dubbo, Parkes, Wagga Wagga, Deniliquin, Griffith, Hay, Tibooburra, Cobar, White Cliffs and Ivanhoe. Wilcannia airport AWS recorded a wind gust of 104km/h at about 740pm from a thunderstorm. Cobar airport AWS recorded a wind gust of 91km/h at about 940pm from a thunderstorm.